At least once a week I find myself in the situation of having way too much of something that won’t last another couple of days, or, more often, several things. This week’s culprits all came from my garden. It was one of those weeks when the artichokes and radishes were both about to bloom, and needed to be eaten or wasted. And in the case of the radishes the situation was even more dire as they seed prolifically and I’d already decided their mediocre taste wasn’t worth all the work to remove all the dirt from the roots (so their mediocre taste isn’t dominated by dirt taste). 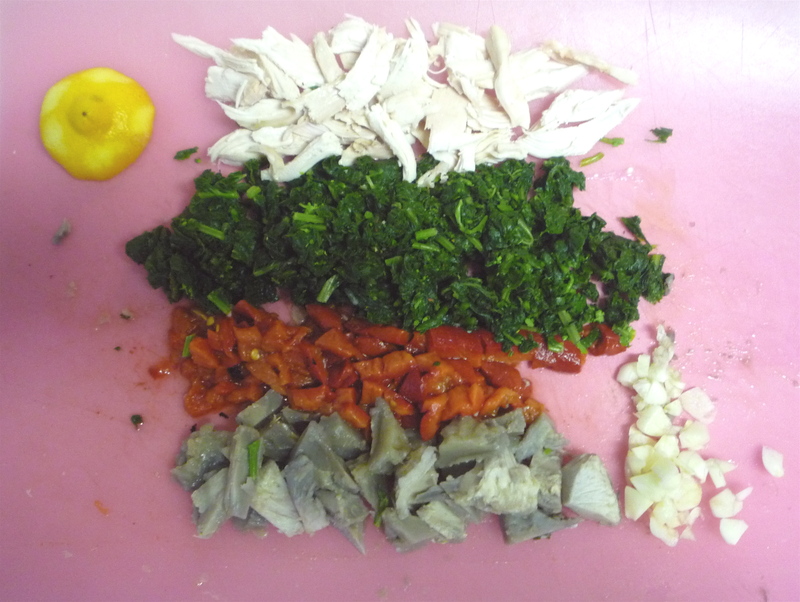 So I had about a quart of blanched radish greens and three artichoke hearts on my hands. (I ate the leaves this weekend with some garlic lemon butter. I’m one of those who finds it tastier and more fun to eat the leaves than to deal with a whole heart or two.) Even though they were older plants, the radish leaves were as mild as spinach, but a bit more fibrous. 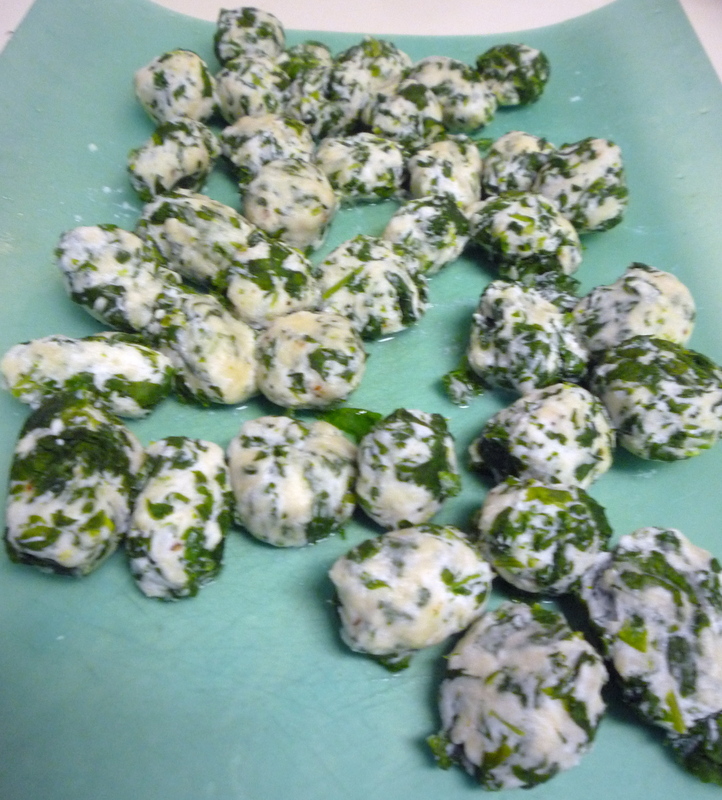 Luckily I also had a tub of ricotta and decided to make ricotta-radish green gnocchi. And, since I had the artichoke hearts to deal with I decided on an Provençal-ish sauce. In a bowl, combine everything but the flour and mix to combine. Add the flour and mix until just combined. If the mixture seems too loose add a bit more flour. Lightly flour a surface and your hands. I usually roll out a rope about a the diameter of a nickel and cut into pieces, but the fibrous nature of these greens made it difficult to cut through the roll without completely deforming it. So I just shaped them by hand, pinching off a bit and rolling into an egg or flying saucer shape. Drain, or remove with a spider, and place in single layer. Can be kept overnight at this stage. If I’d had a tomato and olives, I would have added them. Heat 2 T olive oil in skillet, add garlic and cook over medium heat until it begins to brown. 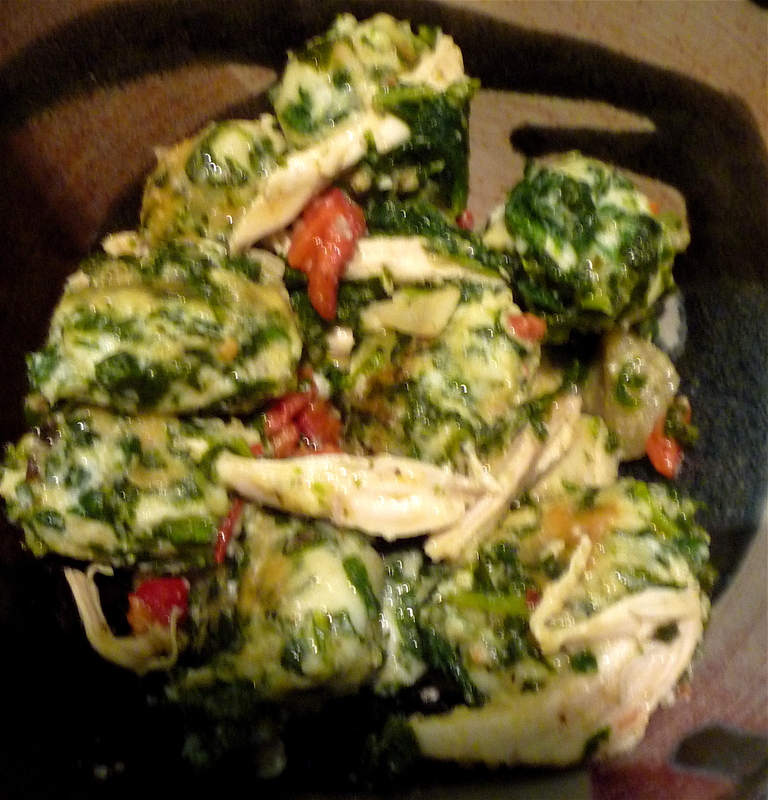 Add artichoke hearts or anything requiring a longer cooking time along with the herbes de provence. Add remaining ingredients and warm through. Deglaze with white wine and when bubbling subsides remove to a large serving bowl. Heat butter and enough olive oil to cover bottom of the same skillet over medium heat. Add gnocchi in a single layer and cook until browned on each side, about 3 minutes per side. Cook in multiple batches if needed. Add reserved topping back to skillet and toss to combine over heat. When everything is warmed and mixed return to serving bowl and squeeze lemon over the top. Add at least 1/4 cup cheeze and mix thoroughly. 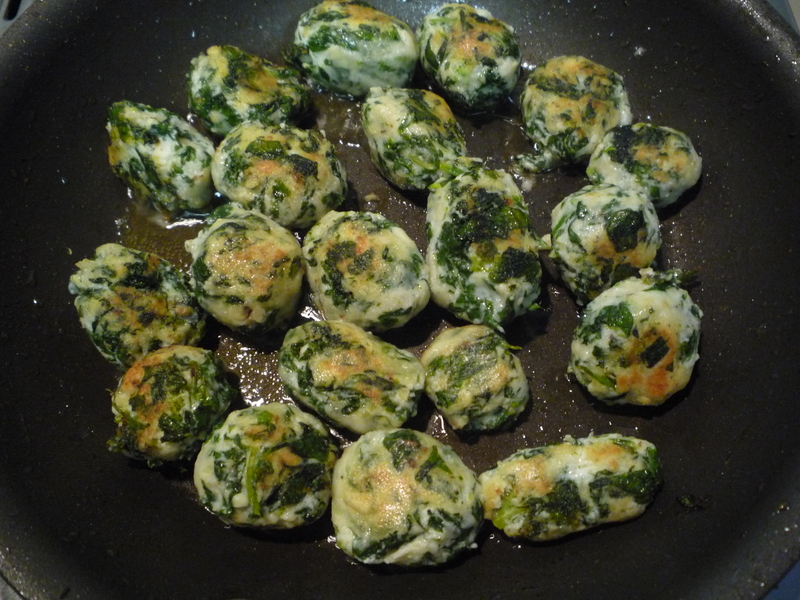 Serve with additional cheese, parseley, and black pepper.